A 100-foot-tall tree is taking root in South Lake Union. Like so many things in the recently reborn neighborhood, it’s a transplant—a piece called “Middlefork” by Seattle sculptor John Grade, who, after casting a live tree in the woods near North Bend (climbing up, applying protective foil, then plaster) is creating a new take on the original. 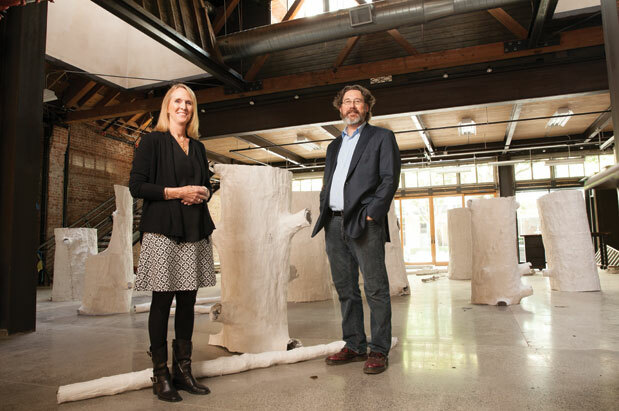 Having transported the plaster molds from the forest to the city, Grade will carry out his vision (a hollow cedar sculpture based on the casts, hanging horizontally, 100 feet long) over the course of several months in the new art studio known as MadArt Space. And thanks to the bank of street-level windows, he’ll do so in full view of the public. That question led to a show in Madison Park (Milliman’s home neighborhood) called Window Art Project, for which she commissioned 16 local artists to create installations in several storefronts. In subsequent projects, windows have been more implied than actual: MadArt in the Park, 2010, featured several large-scale temporary installations by Seattle artists in Cal Anderson Park; for Mad Homes, 2011, Milliman commissioned artists to have their way with five neighboring North Capitol Hill houses slated for demolition. And for the forthcoming Mad Campus (this fall), art will pop up in surprising places across the UW grounds. With the opening of the permanent MadArt Space in May, the windows are back, and they are beautiful. Milliman and her husband, Glen, bought the 1927 one-story brick building on Westlake Avenue—which, legend has it, was the location of Washington’s first DMV—in 2011. They hired local architectural firm Graham Baba to transform it from a dropped-ceiling, carpeted, cubicled office space into a wide-open, sleekly industrial, glass-fronted, pedestrian-friendly art-making mecca (with killer skylights). Milliman says the idea grew out of the MadArt in the Park event, when she learned several of the artists involved didn’t have studios large enough to complete the pieces they had in mind. MadArt Space caters to artists who work big. Participants will be hand-selected one at a time for a kind of residency (minus the sleeping quarters), the only catch being that there are no curtains, so the artistic process is visible to all passersby—the busy, the badged, the biotechie—in South Lake Union. Previous Happy Birthday, Smith Tower!